Earlier this morning, over 500 professors from the Association of Pennsylvania State College and University Facilities were picketing outside of the Pennsylvania State System of Higher Education’s Dixon Center as the Board of Governors were holding their quarterly meeting. Faculty members had the support of other unions and were joined by representative from the Pennsylvania AFL-CIO, the United Food and Commercial Workers union and a few dozen students from surrounding universities. The union, APSCUF, has been working over 465 days without a contract and have been in bitter contract negotiations with the State System of Higher throughout most of that time. Some of the main issues include increasing the number of adjunct faculty teaching within the state system, increase the workloads for adjunct faculty while decreasing their salaries, allowing graduate students to teach classes and allowing professors to teach classes that are outside of their disciplines. If both sides cannot come to an agreement by 5:00 AM on October 19th, PASSHE professors will walkout and go on strike. At today’s Board of Governor’s meeting, chants like “If you think Florida is so great, then go back to the Sunshine State” and “FAIR CONTRACT NOW” directed at PASSHE Chancellor Frank Brogan were heard as the meeting was going on. Towards the end of the hearing, over a dozen students walked in with a petition showing students support for their faculty. They began circulating the petition last week and were able to gather over 1,200 signatures from students throughout the 14 state university system. As the meeting was winding down, the group of students stood quietly along the back wall held their petition and raised their fists in the air as an act of solidarity with the 500 professor who were picketing on other side of the wall. This drew the attention of board members and the Chancellor as he was walking by to give his closing remarks. The director of the Board of Governors, Cynthia Shapiro, closed the meeting by asking for closing comments. 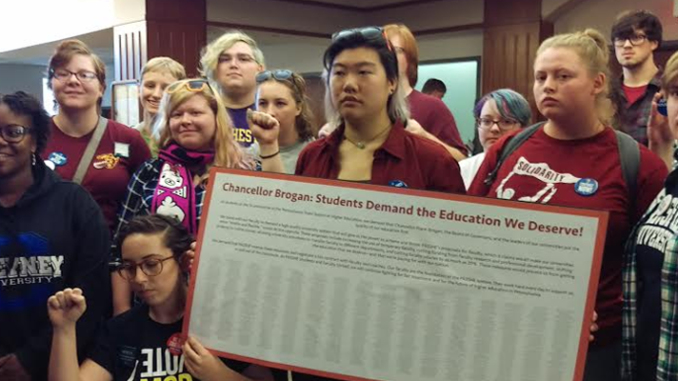 One student stepped forward and yelled in the direction of Chancellor Brogan asking “how are you [Frank Brogan] able to give yourself a 3 percent salary raise, but cut salaries of adjuncts by 20 percent?” The students then asked the chancellor to talk to them and began chanting “STUDENTS FOR FACULTY” as the board members were leaving the room.